This week’s recipe is one I made especially for my fiance. 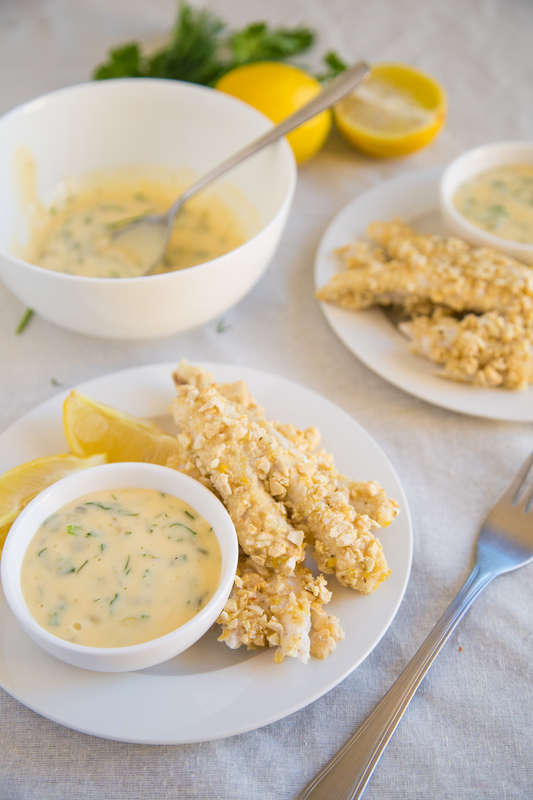 It has three of his favourite foods; flathead, cashews and lots of tartare sauce! This recipe is so easy to make, including the tartare which is the first thing you want to do to ensure all the beautiful flavours have time to develop. Tartare is made with a mayonnaise base, and I just wanted to make special mention of which oil I recommend you use. I use a light olive oil (Bertolli brand for those in Australia), and definitely not an extra virgin light. I made that mistake once and it was so bitter! You can also use avocado or macadamia oil but they can be quite expensive to buy for the amount you will need, but you can do half and half with the light olive. You can use a blender to make your mayo, but you can also whisk it by hand which I think is a rewarding experience if you have the time. When choosing the gherkins and capers, look for ones that just have salt, water and vinegar as the ingredients with no added numbers. What I love about this recipe is that it uses the whole lemon! You use the juice in the tartare sauce and the rind in the crumb for the fish. You don’t have to use flathead fillets, you can definitely use whichever fish you fancy but there’s something visually appealing about flatheads arranged on the plate with the tartare. Preheat the oven to 180C and line a large tray with baking paper. To make the tartare, blend together the egg yolks, dijon and lemon juice. Very slowly add the oil in a thin stream while keeping the motor running. As it gets thicker, you can start adding the oil a bit faster. Once the mayonnaise is made, combine with the gherkins, capers and herbs and season with salt and pepper. Set aside while you make the fish. In a bowl combine the cashews, almond meal, lemon zest and season generously with salt and pepper. Whisk the egg in a second bowl. Dip each flathead fillet into the egg and then press and roll into the cashew mixture (it works best one at a time). Arrange the fish on the tray and bake for 10 – 15 minutes or until the fish flakes when tested. 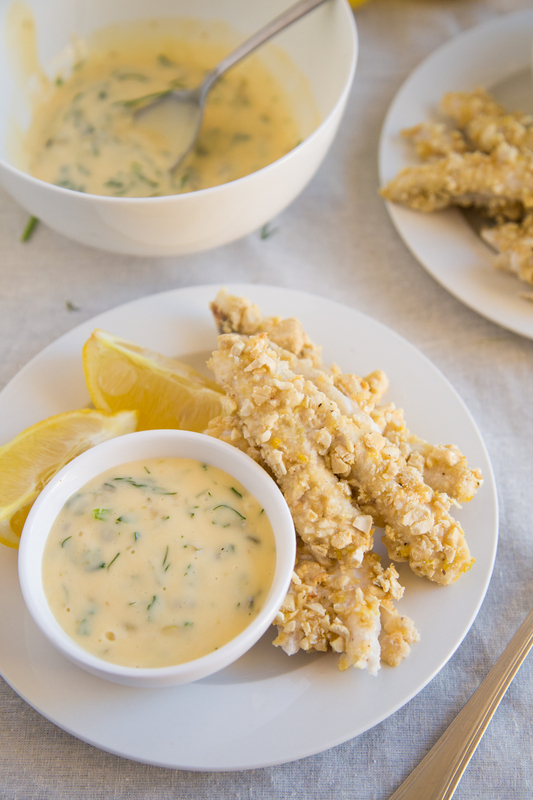 Serve with your beautiful homemade tartare sauce and lemon wedges!